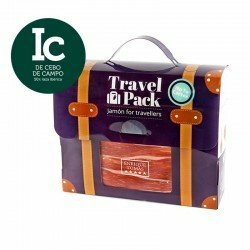 In Enrique Tomás we much care to bring only the best Jamón of the world to your table; and always bearing in mind our principle is that the best Jamón is the one you like the most, we offer you the one that we like the most, the Paleta iberica -Ham shoulder de cebo de campo, a new product of the highest quality and 18 months of dry-curing time. After a measured process of pig fattening based on cereals, wild fruits and acorns, the Ham Shoulder is clearly a great alternative for those who enjoy an intense and elegant flavour at the same time. 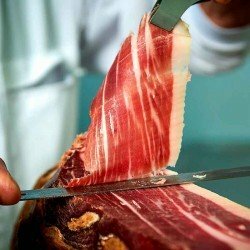 In this food delicacy you will find the flavours of the acorn and the intensity of any Ham Shoulder, the unmistakable aroma of the ham coming from the infiltrated fat of the Iberian pig and that light and elegant salty touch. In Enrique Tomás we offer you a whole series of ham types to meet to your needs and enjoy it the way you want, that is from whole pieces to all types of sliced formats. If you don’t taste it, you are missing really something! 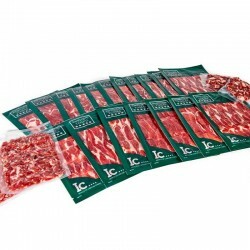 The Iberian pig is unique and as such, what we produce from it is nothing more than a variety of delicacies. In addition to being born in our wonderful Iberian Peninsula, these pigs have an exceptional characteristic: they are the only animals capable of infiltrating fat into the muscle, giving their meat an irresistible taste and texture. When we speak of the characteristic "cebo de campo", we refer directly to the pig's feeding. All the Iberian pigs feed in the same way until they reach the first 100 kilograms of weight, first the mother's breast and then with fodder, in general a basic diet for the animal to grow strong, muscular and with very resistant bones. To acquire the rest of the necessary weight, the animals are released in the pastureland and that's when our Iberian pigs feed on free-range acorns, and finally move on to the last stage with more cereals. The term campo refers to release the animals in nature, where the animal has been fed with acorns, wild fruits and what the pastureland has provided the animal with. Origin of the selection: Selected quality/price of all the Iberian Paletas of the peninsula.